This rural farmhouse is situated on an estate of 105 acres with oaks, chestnut trees, Mediterranean vegetation, vineyards, olive trees and a lake for fishing. The agriturismo is located 600 meters above sea level and in the distance is the sea, the peaks of the Apuan Alps and the hills of Chianti Classico. 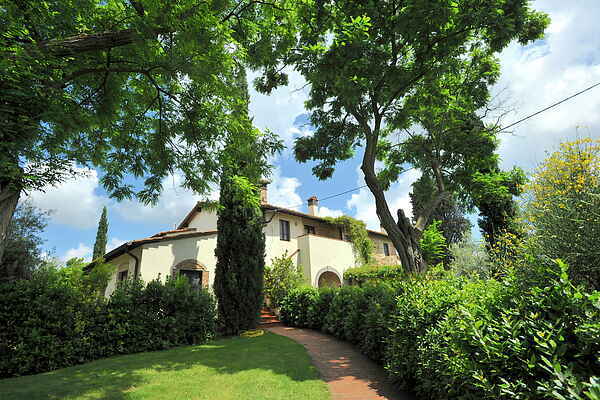 The farmhouse has been expertly restored by a famous Florentine architect and consists of eight comfortable apartments. The apartments are furnished with Tuscan furniture and have a typical rural atmosphere. The beautiful garden is separated by hedges of rosemary, bay and lavender, and there is shade of cypress trees and ancient oaks. The flowery path leads to the sun terrace and the delicious and refreshing swimming pool, shaded parking, and the vineyards, olive groves and restaurant. The owner has another agriturismo 1 km away with a free tennis court. This agriturismo is a wonderful place for people who love wine and good food, nature, art and tranquility.